Cacin Hall is an ideal location for your special day. An elegant indoor ceremony in the beautiful Starlight Terrace Ballroom, you will find the perfect place to exchange your vows. We have many amenities including two 60 inch LCD televisions that you can showcase your family memories. Celebrate the arrival of your newest addition(s) at the affordable and elegant Cacin Hall. We offer a white leather baby shower couch and DJ equipment. We only host one party at a time which allows your event to be our focus. Indulge in all our amenities and share an intimate setting with loved ones. Cacin Hall has partnered with the best local vendors to give you affordable options. Select any theme you like because our hall is fully customized to your style. The most memorable part of the reception is the entertainment. Your first dance is traditionally part of your momentous day. Contact our local entertainment Vendors for more details. 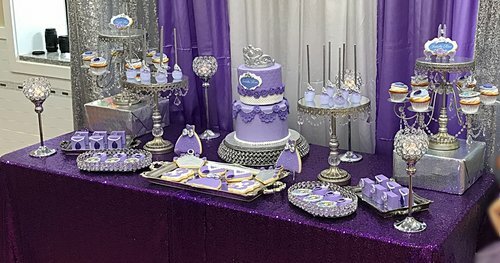 The theme will set the tone for your affair and make all of your other party related decisions much easier such as color scheme, venue, entertainment even souvenirs. Check out our gallery for inspiration. Also now is a good time to set a budget. The best venues tend to get booked fast so it is important to start your search early. Contact Us today for a personalized tour and/or to confirm your event date. Upon request we can refer you to local catering vendors here or enlist the good cooks in the family to help out. Let's not forget the main centerpiece: the cake. Enlist entertainment from the best in the business. Your entertainment is what will make your event memorable. Even simple things like playing party games are great way to bring people together. We also have vendors that can provide clowns, photo booths or even a money pit. Purchase decorations, food, souvenirs and make final payments to vendors. We will be happy to answer any questions you may have. Have a great event!